You know my internet connection has gone for a toss & with my data card I can only do text-heavy posts. 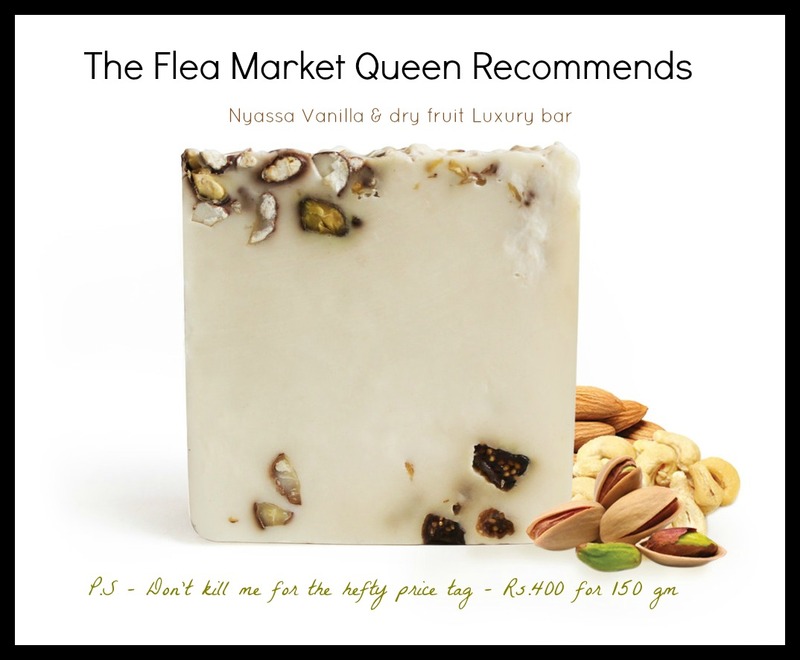 I have been using the Nyassa Vanilla Dry fruit Luxury bar for the last 3 days and I am in awe! 1) It stays true to its name- There is vanilla, there are those bits of dry fruits(real figs, cashews, almonds and pistachaio) & one look at it, it fools you into believing its a chunk of malaidaar mithai :) A luxury bar indeed! 3) A creamy lather that doesn't feel artificial & a fragrance you would fall for .Its difficult to resist the urge to bite into it ! The one I tried was a sample in my VELLVETTE box. This soap is available on VELLVETTE website for purchase.I am a sucker for bath & body products and love to constantly fill my bathroom racks with new indulgence.This surely is a treat & at a price tag of Rs.400 for 150 gm , its an expensive one for sure! In my recent trip to Istanbul ( posts coming up; just pray my internet connection is restored soon) ,I bought a lovely pomegranate handmade soap which smells as divine.But even that wasn't as expensive as Nyassa. So people at Nyassa, you must make a note! Turkey is famous for its turkish baths ( Hammam) and hence the bath products are made with a lot of love too.More in my post on Turkish bath products later! JUST ONE THING- I want the price to go down!!! It MUST!!! A few more reviews lined up, till my wireman does the repairs ! Till next time, see you ! Great effort... superb organic content. If you are interested in Flattering Wedding Hairstyles Idea For Brides do have a look.